In 2000, through a series of synchronistic events, Santiago (Dr. J. E. Williams) met Sebastian Pauccar Flores, a traditional Q’ero shaman, at Machu Picchu. 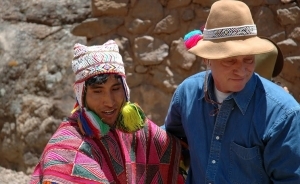 Over the next four years, they established a close abiding friendship that has been described by the Q’ero as “one soul in two bodies.” Ayniglobal grew out of their deep rapport and dedication to serving Pachamama and the Apus, the spirit of the great mother and the intelligence residing in highest mountains. Santiago’s book, The Andean Codex, documents the first years with Sebastian and serves as an introduction to Q’ero earth-based wisdom. 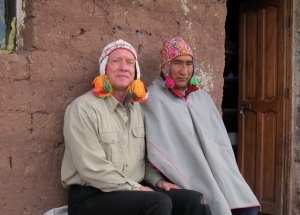 In 2008, after years with Sebastian and many initiations in Q’ero shamanism, Santiago and Sebastian journey to the most sacred of all Andean mountains, Apu Ausangate. Here he deepens his knowledge of the inexorable value system of the Q’ero. In the heartland of the gods, Santiago and Sebastian make a commitment to help others understand Ayni – the original instructions of reciprocity among people and nature, and universal responsibility to every aspect of life. Santiago’s book, Light of the Andes, presents insights from his journey to Ausangate, including accounts of authentic Q’ero prayers and practices, beliefs and teachings. In 2010, as a natural outcome of his work among the Q’ero, Santiago founded Ayniglobal to further his mission and honor the commitment he made with Sebastian. Volunteers and donors, advisors and supporters came to help us with the many details of starting a non-profit. Ayniglobal is a mission-driven nonprofit with a bent towards advocacy.Ayniglobal, a nonprofit 501(c)(3) corporation, was established on 11/17/2010 under the laws of the District of Columbia, organized and operated exclusively for charitable, scientific, and educational purposes. Ayni is the touchstone of the Q’ero worldview. Best thought of as reciprocity, Ayni also implies reverence and universal responsibility. Ayni is the guiding principle for a way of life that embodies ethical behavior and spiritual practices that promote reverence for the biosphere, family and culture. In practice, it fosters social harmony and engenders a sense of responsibility for all life. Ayni is the original sustainability principle. Our mission is to protect and preserve traditional indigenous cultures and ancestral lands including people, animals, plants and water systems. Helping people and protecting culture requires service; preserving lands requires engagement in tribal, local, and national politics. We serve one person, one family, one tribe, and one community at a time. We engage by forming alliances and networks of leaders and professionals who understand the intrinsic value of safeguarding indigenous people and their lands. And, we advocate relentlessly for fair, meaningful, and sustainable policies that protect and preserve land and people. We also have an entrepreneurial spirit. Working to sustain our people and projects from the profit of small social businesses, we foster self-generated income by investing in and advising on enterprises like Q’ero textiles, eco-travel, and shamanic journeys. Integrity, hard work, good management, creative decision-making, anddedicated service – it works. Projects are the beginning, but we have a bigger vision: To transform society by restoring global balance, fostering ecological sustainability, and creating sanctity in the environment as a whole. The starting point is embracing principle-guided living. Santiago was taught that there is a code of life, the original instructions, embodied in Ayni. Social justice for indigenous people including legal assistance and community mediation with qualified experts. Indigenous health and medicine including ethnobotanical and community health research. Education including early childhood education and adult learning for indigenous people. Biodiversity protection including preservation of traditional homeland integrity to ensure ecosystem stability that will endure for generations. Cooperation with indigenous wisdom keepers for the dissemination of native principles related to ethics and environmental issues to be presented to world leaders, as well as in partnerships with governmental and non-governmental agencies, and strategic affiliations with local communities, educational institutions, businesses, corporations, and non-profit organizations.